Back in October 2015, the Mitakon Speedmaster 135mm f/1.4 drew attention for offering a particularly wide f/1.4 aperture against its telephoto focal length. Now, the lens has been relaunched and its mount options expanded. Previously only available in Canon EF, Nikon F and Sony FE fittings, the optic now additionally comes in Sony A and Pentax K options, as well as in Leica L-mount and Fujifilm G-series fittings, the latter making it compatible with the company's medium-format GFX-50S model. 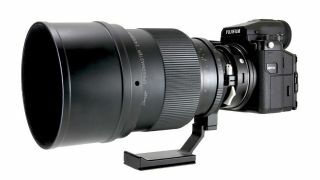 Pairing a focal length of 135mm (35mm equivalent) and an aperture range of f/1.4 to f/16, the lens also boasts a clickless aperture ring for silent adjustment during video recording. Its optics have been made by Zhong Yi, a venerable Chinese manufacturer with a 30-year history of producing high-quality lenses. 11 elements are spread over five groups, with three extra-low dispersion elements among these, while an 11-blade diaphragm is said to produce smooth bokeh. The Speedmaster 135mm f/1.4 measures 160mm in length and 111mm in diameter, with a filter thread of 105mm. The 3kg lens is a manual-focus-only affair, with a minimum shooting distance of 1.6m. The company behind the lens has also released a couple of sample images to give users a feel for what the lens is capable of producing – take a look below. DPReview also got hold of a pre-production sample of the lens when it was first announced back in 2015, and put together a gallery of sample images showing off the bokeh. The Mitakon lens is available for pre-order on the Shotenkobo website now. It’s possible to reserve one now for a deposit of 60,000 – about US$530 or £401 – and the manufacturer’s "preferred" full price is ¥330,000 (excluding tax), which works out to roughly US$2,913 or £2,208.